"I think it's always good to be the outsider, so people expect bad of us and then we surprise people," the United midfielder said after his team's 2-1 smash and grab win against Juventus on Wednesday night and, no doubt, with one eye on Sunday's derby at Manchester City. 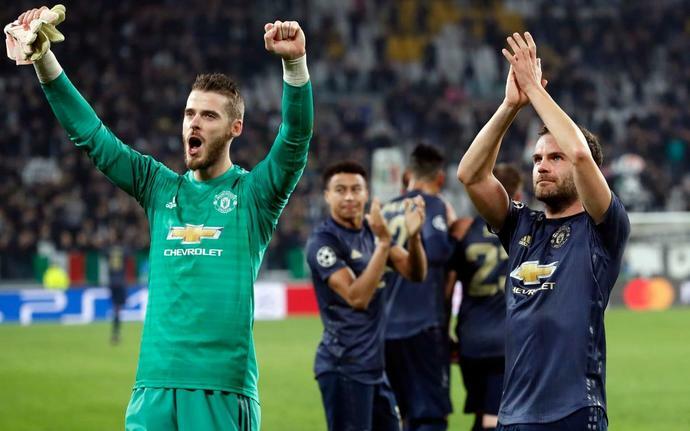 A fortnight after being outclassed by Juventus at Old Trafford, victory at the Allianz Stadium represented a lot more than just a boost to United's prospects of reaching the Champions League knockout stages. It was not the best performance under Mourinho that some have rather hysterically suggested. As Cristiano Ronaldo was keen to point out, Juventus should have been three or four up by the time Juan Mata equalised with that sumptuous pressure free-kick. Yet, following on from Saturday's last gasp 2-1 win at Bournemouth, United had dug deep to come from behind to win for the second game running, something they also did against Newcastle and came within seconds of achieving at Chelsea, and that seems particularly pertinent given the talk about players no longer pulling for the manager. Naturally, Mourinho never seems too far away from a crisis but there has been a spirit, resilience and endeavour to United's recent displays that, amid the many obvious flaws, suggest they are not quite the lost cause they seemed during a hopeless start to the campaign. Mourinho could not resist cupping an ear at the end to the Juventus fans who had insulted him and his family but, despite Paul Scholes' complaints about the Portuguese again making it all about him, this felt like behaviour much more in keeping with the mischievous firestarter of old than the morose, gnarled figure of late. Far better that Mourinho aims this sort of thing at the opposition than in house, United's fans, staff and players will say. Whether he now opts to aim that fire across the road remains to be seen, although the opportunity to question the validity of City's recent success in the wake of accusations they systematically cheated Uefa's Financial Fair Play rules would appear an open goal for Mourinho. You had to wonder if he was simply biding his time, waiting for the right moment to go on the offensive, when, asked on Tuesday about the leaks to German magazineDer Spiegel, he resisted the chance to stick the boot in on City. Yet Mourinho has harboured suspicions about his rival's spending for a long time. It was on United's summer tour of the US last year that the United manager claimed there "are some strategies of disguise" that ensured "the FFP authorities" have "big and difficult work to do" and he has talked subsequently about the problems of trying to keep pace with a club he described as having "unlimited" spending power. The Der Spiegel allegations this week are certainly perfectly timed from United's perspective. They offer a chance to get under City's skin but, if United lose on Sunday, and certainly if they lose big, Mourinho will also have a ready-made excuse. How can United expect to compete with a team accused of cheating the system? Another season will pass without Champions League glory for Pep Guardiola's Manchester City, but few will forget the manner in which the quest for a historic quadruple was ended by a combination of Tottenham Hotspur and VAR. Spurs survived a seven-goal thriller on Wednesday night at the Etihad, losing the battle 4-3 but winning the war on away goals thanks to their 1-0 victory in the first leg a titanic quarter-final tie. A match that saw City lead 1-0, trail 2-1, then forge ahead 4-2 to lead the tie for the first time before Fernando Llorente's controversial decisive goal was allowed to stand after a VAR check for handball, brought one final twist in stoppage time. Virgil van Dijk admits to being unsure as to how Liverpool should set about trying to contain the threat of "best player in the world" Lionel Messi when they take on Barcelona. The Reds are set to face La Liga heavyweights at the semi-final stage of Champions League competition. Messi, who netted twice against Manchester United in midweek to dash the European dreams of one Premier League opponent, poses the most obvious threat to Liverpool's ambition. Fernando Llorente believes the decision to award his decisive goal for Tottenham against Manchester City was the right one. Llorente scored in the 73rd minute of Spurs' 4-3 second-leg loss to City, but they reached the Champions League semi-finals on away goals after a 4-4 aggregate draw. The VAR reviewed the goal after the ball appeared to hit the forward's arm, eventually going in off his thigh, and it stood. What Does MLS Need To Do To Finally Win CONCACAF Champions League?